One of my biggest concerns for when baby brother arrives has always been how Camden will feel. I'm probably reading into it way too much, but I really want him to feel included, special, and loved. I've always liked the idea of giving him a gift in the hospital specifically from his little brother, and also having things that will keep him entertained at the hospital when he visits (that can also double as activities to do at home when I'm nursing, etc.) I definitely think they will help make him feel special, he loves getting to open little gifts! 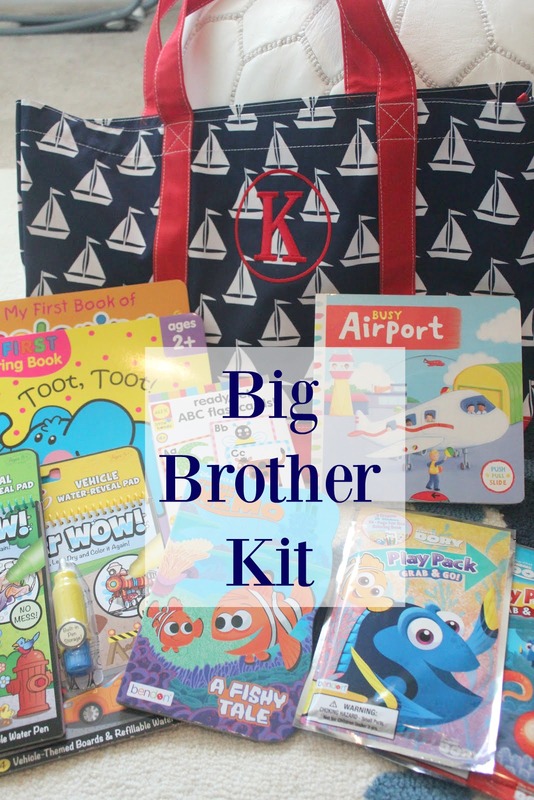 I wanted to share what I put in his big brother kit in case any of you plan to make one for the future! My plan is to only bring a few of these items (like the book and 1 or 2 coloring books) that I will wrap individually to bring to the hospital, and have the rest for when we get home. -Melissa and Doug Water Wow Books and My First Coloring Books (from Target): Everyone raves about these water books! Cam has just started getting into coloring more, so I think they will be a big hit and keep him occupied. They're also perfect for travel. -New Books: Busy Airport (he loves this series) and a Finding Nemo short story from Target's $1 spot. Cam absolutely loves to read, so new books for him are a must! 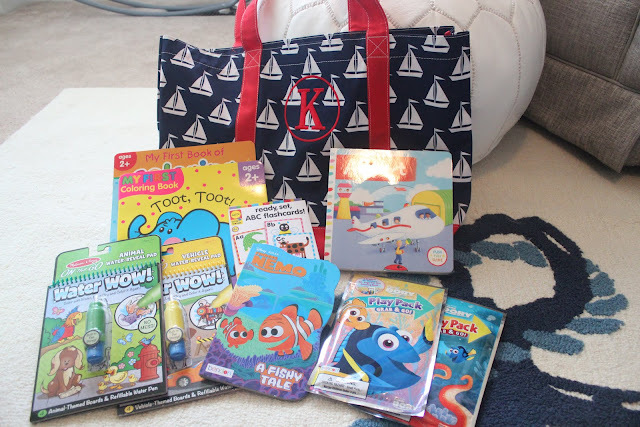 -Play Pack Grab & Go (2): These are also from Target's $1 spot and include a coloring book, crayons, and a sticker book. Stickers can entertain him for a while, so I knew they'd be good to put in the bag. -ABC Flashcards: These are so cute and guess where they're from? You guessed it, Target's amazing $1 spot. I figured all of these items are good because they will keep him entertained longer than a toy would. Plus, he has all kinds of toys and balls at home. I do plan to put a few of his favorite snacks in the bag, too. Another good idea would be to include a new big brother or sister shirt for the older sibling to wear! Lastly, I just came across this book which I'm now considering ordering because of how stinkin adorable it is. I love how it incorporates both of the kids' names in the book! 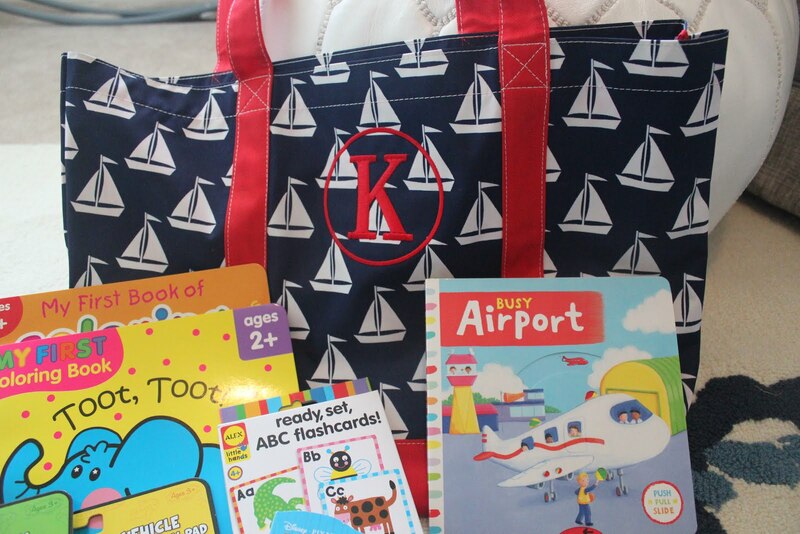 This navy sailboat tote couldn't be more perfect to hold everything (and to just use in the future for the boys-I'm obsessed with the cute print and colors!) Cam loves boats so when things are busy at home and I'm nursing his brother, he can pick an activity out of the awesome "boat bag". I really think he's going to love it and it'll be a big help! PS: The "K" on the tote is for our last name - not baby brothers initial. :) I wanted to use our last name so that I can use it for both of the boys. Have you made a big brother/sister kit or bag before? What did you include in it? If you have any great ideas of things I should add, please send them my way! Something that helped us was Daniel Tiger. They have a number of episodes about being a big brother and what happens when the new baby gets here, on Netflixs. It gave us some songs to sing together and helped Alex know what to expect. Alex is a little older then Cam, but it might be worth a try! Congratulations on the new baby and beautiful family! When my first little brother was born my parents got me a really nice baby doll named Lauren 'from Andrew' I still have and cherish her! We gave the personalized book and medal to my 3 year old when we had our son 3 weeks ago. She loved it! She wore her medal at the hospital and we have read it every night since the baby came home. This is such a cute idea and I love that boat bag! The Water books are great!! I surprised #wiggydiggy with one on our flight and he played with his for HOURS uninterrupted. I was amazed. He still asks for it now that we are home from vacation!